Born from a covert project led by high performance enthusiasts, the iconic Golf GTI is the much praised product of years of secret design sessions that sought to encourage Volkswagen to create a sportier model for the younger driver. The GTI has since gone onto sell more than 1.9 million vehicles in its 37 year reign in the industry’s ever-evolving success story. Since its 1976 launch, Volkswagen has continued to set the tone for the sporty compact vehicle to uphold its place in the history books. 1. The legendary GTI has accrued a cult-like following since it first burst on to the automotive scene in 1976, and is the brand’s best-selling model ever. When the first Golf GTI made its debut 37 years ago, the letter combination became – almost overnight – the definition of a new vehicle segment. Since that time, only the GTI has been considered the original among compact sports cars. 2. While the first Golf GTI was originally planned as a limited series of 5,000, the model has gone onto sell 1.9 million vehicles in the past 37 years. 3. Before the GTI had officially gone into production, the ‘Sport Golf’, as the engineers referred to it, was actually the first unofficial GTI. 4. Volkswagen test engineer, Alfons Löwenberg, wrote an internal memo to colleagues from Volkswagen’s Research and Development department, proposing that Volkswagen should consider putting together a proper sports model. Some time later, a new vehicle with the project code EA 337 (the internal code name for the future GTI) had reached the final stages of development – and a modern front-wheel car with high-performance would open up a completely new group of customers for Volkswagen. 5. When the 46th Frankfurt International Motor Show opened its gates to the public on September 11, 1975, a red wonder celebrated its debut at the Volkswagen booth: the Golf GTI concept car. “The fastest Volkswagen ever” boasted the advertisement – and that was no exaggeration. The GTI accelerated from a zero to 100 km/h in about nine seconds, leaving considerably larger and more expensive cars behind. 6. The GTI ended up costing 13,850 German Marks when it was launched in mid-1976. Despite the higher price, dealers still managed to sell ten times the planned sales volume in its first year on the market. 8. A landmark month for Volkswagen, November 1990 saw the production of the 1,000,000th Golf GTI. 9. Volkswagen has celebrated the anniversary of the GTI in many memorable ways. On the 30th anniversary of the GTI, a 169 kW / 230 PS turbo engine was introduced in the Golf GTI Edition 30. 10. Volkswagen headed back in time to the 1970′s to celebrate the 35th anniversary of the Golf GTI in a ‘ Back to the future’ style campaign (Preview) . Viewers could follow the vehicles adventures via a series of videos on the Volkswagen UK Facebook page. The first video shows the time traveling car appear at Volkswagen’s German headquarters at Wolfsburg in 1976 with the second one showing where the Golf ends up. 13. The amateur songsters do not relive Sinatra standards, mimicking the GTI’s new slogan, “Often copied. Never equaled”. 14. Celebrating the legacy of the GTI, thousands gather around the world at enthusiast events. GTI International, Britain’s biggest event for fans of the Golf GTI and other related high-performance Volkswagen Group models, is now in its 26th year. The main focus of attention is the quarter-mile sprint track where visitors to the event can test the acceleration of their cars against the clock on a proper drag strip. 15. Since 1982, the ‘GTI Meeting at the Wörthersee’ has been a holiday in the calendar of fans of the sporty Volkswagen vehicle. 16. GTI’s greatest fans have been celebrating the iconic vehicle every year at the Wörthersee in the Austrian state of Kärnten. Thousands come for this event. In 2007, Volkswagen put a Golf on wheels that was like no other: The GTI W12-650 showcar. No Golf has ever been more powerful, or wider, or faster. The GTI W12-650 gives the appearance of having come directly from the racetrack. A Golf that could be the pace car for the 24 hour race at Le Mans. Its name is its mission: W12 cylinders, 650 PS (477 kW at 6,000 rpm). A showcar, no more, no less. At the same time it demonstrates the enormous potential that such a car can offer. 17. Based on the Mk V and powered by a mid-mounted 6.0-litre W12 engine producing 650 PS, theGTI W12-650 could accelerate to 62 mph in 3.7-seconds and could theoretically achieve a maximum speed of 201 mph. 18. In 2009, the Golf GTI Cabrio with 333 PS (245 kW) was the first time Volkswagen apprentices have designed a cabriolet for the GTI Festival in Wörthersee. 19. … And it was the first ever collaboration between young talents from Wolfsburg and Osnabrück, Germany. Thirteen apprentices of four professions built a two-seater in red-white-red, the national colours of the host country. 20. Showcased at Wörthersee in 2013, Volkswagen developed a concept car for the race track. The “Design Vision GTI” transfers the appearance of the GTI icon to car racing. 21. The “Design Vision GTI” can reach up to 300km/h. 22. In 2009, Volkswagen constructed a Scalextric track on an epic scale inside a hangar to lend armchair (or office chair) enthusiasts the chance to race the new hot hatch online and against the clock. 23. The Scalextric track was 30ft by 25ft track and was the work of a team of 60 modellers and features over 200 scale buildings. It forms the basis for the ‘GTI Project’, a new online game through which you can control the 1:43 scale Golf GTI as it negotiates the hairpins, straights and narrow bridges that make up the track. 24. Special edition GTIs have been popular over the years. The third generation GTI had several popular special edition models throughout its lifetime, including the Trek and K2 editions. The Harlequin model (pictured) which boasted different colours across each door and panel, was produced in limited volume, with only 264 sold! 25. In June 2010, three of the world’s most recognised German badges – Volkswagen, GTI and adidas –for the first time melded into a combined product as the Golf GTI adidas, an exclusive model which today is regarded as a collector’s item for Volkswagen enthusiasts. 26. Volkswagen raised the roof, with the launch the first ever convertible GTI on the 22nd of June 2012; a move that was eagerly anticipated by followers of the GTI. Its standard electro-hydraulic drive opens the top in just 9.0 seconds. It can also be operated while driving at speeds of up to 30 km/h. 27. The convertible GTI’s soft top was joined to the roof bows by screw-fastened fabric retention strips. Consequently, even at higher speeds – which can theoretically reach over 230 km/h in the Golf GTI Cabriolet – the fabric roof does not fill with air, which has a positive effect on aerodynamics. 28. 100 per cent more power – The engine of the first Golf GTI produced exactly 81 kW / 110 PS. Now, the seventh generation Golf GTI sends at least 162 kW / 220 PS to the front wheels – which is exactly double the power of the first Golf GTI. In addition, Volkswagen is offering a factory installed power enhanced engine that produces an additional 10 PS (169 kW / 230 PS) – it is on-board the Golf GTI Performance. 29. The combined fuel consumption of the seventh generation GTI was reduced by 1.3 litres or 18 per cent compared to the previous model (155 kW / 210 PS). 30. Like the very first Golf GTI, the seventh generation also sports typical GTI insignia. On the new model they include the red trim strip on the radiator grille that now extends into the headlights. 31. The newest model is powered by a 2.0-litre turbocharged direct-injection petrol engine (TSI) with 220 PS. In the GTI Performance version, the engine’s maximum power is boosted to 230 PS. Both GTI models develop a maximum torque of 350 Nm (258 lbs ft). 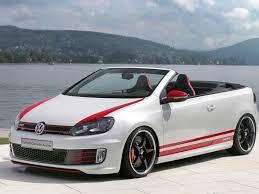 The standard GTI accelerates to 62 mph in 6.5 seconds and reaches a top speed of 152 mph. 32. The GTI Performance has a top speed of 155 mph and needs just 6.4 seconds for the sprint to 62 mph. Despite its impressive performance, the new Golf GTI is in insurance group 29E – five groups lower than its predecessor. 33. The new GTI covers 00-100km- in just 6.5 seconds. 34. The standard body colours of the newest GTI include “Tornado Red”, “Black” and “Pure White”. 36. The big bumper, which is intrinsic to the design of Golf GTI, first launched in 1989. 37. One of the reasons behind the GTI’s amazing popularity is because it has the fun factor of a sports car but still maintains what made the original Golf so successful. Over the years, the GTI has been synonymous with ever-evolving success, with many people growing up alongside the 37 year old motoring icon.